The final day of the 2011 Southern Division Championship crowned Gregory Hoskinson, “Hosko” and the Kentucky State Team 2011 Southern Division Champions on Green River, in Campbellsville, Ky. 14 anglers, the top boater and co-angler from each of the seven states representing the Southern Division, claimed spots at the 2012 Federation National Championship. It was an exciting day as these champion anglers stepped that much closer to the dream of a lifetime advancing to the national contest. There they’ll fish for the “Living the Dream” prize package to include fishing as an FLW Pro for a year with use of a wrapped Ranger boat and Chevrolet truck, as well as, thousands in cash and prizes. Hoskinson, “Hosko” from Louisville, Ky., stole the show from day one bringing in an 18lb 1ounce bag with a 6lb 12ounce lunker to steal the top spot. Hosko continued to fish hard for Kentucky and the final day was worth it all as both he and the Kentucky State team anglers were named 2011 Southern Division Champions. Hosko caught a limit of bass today weighing 11lb 12ounces making his tournament total 43lbs. Preston Clark was right on his heels just ounces away in second with 42lb 8ounces. A 8ounce dead fish penalty on day two made all the difference for Clark as only 8ounces separate him and Hosko. 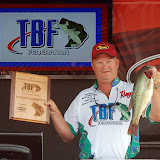 Kentucky TBF State Team Division Champions were determined to pull out a home team victory this week, commanding the lead on day one to solidify that lead today. Kentucky caught a total of 169fish for 344lb 9ounces to be named 2011 Southern Division Champions. The 14 State Champion anglers advancing to the 2012 Federation National Championship are as follows: (boater, co-angler) 1st Place KY: Gregory Hoskinson; Barry W Ward, 2nd Place AL: Robbie Robinson; Rusty Burroughs, 3rd Place GA: Brandon Glass; Steven Phillips, 4th Place TN: Jeff Hill; Wesley D. Taylor, 5th Place FL: Preston Clark; Mark Lundgren, 6th Place NC: H Desmond Jones; Brent Kendall, & 7th Place SC: Robert Rikard; Rich Gerken.